Chloraprep Friction Applicators: Tse Unique Applicators Facilitate A Friction Scrub, Allowing The Antiseptic To Penetrate And Become Active Into Deeper Layers Of Skin. The 2% Chlorhexidine Gluconate/70% Isopropyl Alcohol Formula Provides Rapid And Persistent Antimicrobial Activity On Skin Surface, Reducing The Chance For Infections. 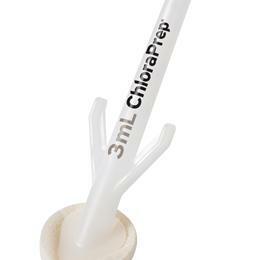 3 Ml Applicator, Sterile, 4" X 5" Coverage Area.